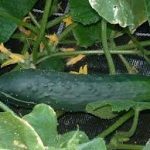 Marketmore is an outdoor ridge type cucumber which has good mildew resistance. Pollination is necessary for the production of the cucumbers. Both male and female flowers must be kept on the plants which are pollinated by insects. A moisture retentive, well drained and fertile soil is needed and a warm sunny situation. Make planting holes and fill them with well-rotted organic manure or compost. Then cover with soil to make a mound. Allow 1 metre between plants. It is usually better to sow direct into the ground. Sow 3 seeds on each mound in mid May to early June. Sow 2cm deep. Thin to one plant per mound. If possible, cover with cloches for protection at this early stage. Black polythene can be put down around the plants to keep weeds down and conserve moisture. Plants are usually allowed to trail along the ground, although they can be trained along a trellis 1metre above the ground. The trailing shoot should be trimmed off after six leaves. This will encourage the plant to branch out, and more cucumbers will form. Water very well at the roots. Water over the leaves but only early in the morning. Feed with liquid organic fertiliser once a week. Harvest Cut from the plant with a knife when 15cm – 20cm long, from late July to August. Keep harvesting to encourage more cropping.